Facebook chief executive and founder Mark Zuckerberg said Wednesday he believes India will be crucial to getting "the next billion online" and helping to alleviate poverty. 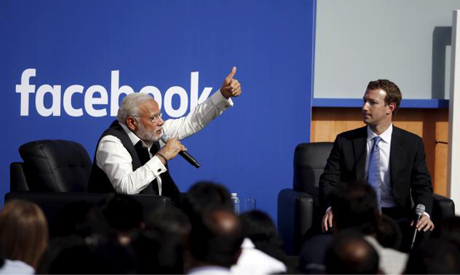 Speaking to about 900 students at New Delhi's Indian Institute of Technology, Zuckerberg said broadening Internet access was vital to economic development in a country where a billion people are still not online. "If you really have a mission of connecting every person in the world you can't do that without connecting people in India," Zuckerberg, dressed in a grey T-shirt and dark jeans, told the audience. "We have the second biggest community in India and we want the next billion to come online," he said, adding that Internet access helps create jobs and lift people out of poverty. India is Facebook's second biggest market after the United States, with about 130 million of its 1.5 billion worldwide users, making it critically important for the site which is banned in China. The 31-year-old billionaire gave lighthearted answers to questions including "Why do I get so many requests for (online game) Candy Crush?" and "If you could have a supernatural power what would you wish for?" But he also vigorously defended Facebook's controversial Internet.org project, which provides free access to the Internet, mainly in poor rural communities, in 24 countries including India. Critics of Internet.org say it violates net neutrality -- the principle that companies providing Internet access should not favour some sites or restrict access to others. "We have a moral responsibility to look out for people who do not have the Internet... and make sure the rules don't get twisted to hurt people who don't have a voice," Zuckerberg said, adding that the programme had brought a million Indians online. Facebook is also exploring new ways to increase access in hard-to-reach areas, he said, such as solar-powered planes to "beam down connectivity" and data-light apps that work on slow 2G networks. Zuckerberg's trip came after a weekend visit to Tsinghua university in Beijing where he delivered a 20-minute speech in Mandarin, a language he has been studying since 2010. He met India's tech-savvy Prime Minister Narendra Modi last month when the premier toured Facebook on a visit to Silicon Valley, advocating the political power of social media.